Ideaal gelegen in het hart van Paphos en op korte afstand van de kust, Diana is een mooi complex met een groot zwembad in weelderige tuinen. Slapen tot 6, is het appartement ingericht, uitgerust en voorzien van een luxe standaard met granieten werkbladen, optionele airconditioning in de slaapkamers (voor een kleine meerprijs), goed ontworpen meubels en elke extra om uw verblijf comfortabel (inclusief wasmachine , Magnetron, spelletjes, boeken, haardroger, zelfs emmers en schoppen en strandlakens!). Optionele Wi-Fi is beschikbaar voor £ 15 per week, hoewel er efficiënt plafondventilatoren in alle belangrijke woonvertrekken en de slaapkamers. Alle beddengoed en handdoeken zijn inbegrepen (zelfs strandlakens) en er zijn privé-ligbedden voor uw gebruik rond het zwembad of op het balkon. Er is een lokale taverna en winkels om de hoek voor de hele dag-tot-dag nodig heeft, een groot balkon met uitzicht op het zwembad en de tuinen en buitenmeubilair om te genieten van het eten al fresco of te genieten van de laatste stralen van de zon en het bewonderen van de Paphos zonsondergangen. Een 10-15 minuten niveau wandeling brengt u naar de kust met zijn zandstranden blauwe vlag strand, de haven en het fort, watersport, winkels, restaurants, bars en musea. Met een scala aan activiteiten om uit te kiezen in Paphos en nog meer in Cyprus zelf, kunt u zo veel of zo weinig als je wilt doen. Diana is uw ideale thuis ver van huis vakantie-accommodatie. Volledig betegeld, licht en helder met een uitstekende onder de gootsteen opslag en planken voor al uw toiletartikelen. "Very nice apartement. Quite close to the harbour. Only a 20-minute walk. Nice pool and all the stuff for daily use was foreseen in the apartment. The only problem we sometimes had was hot water. Good advice: 30 minutes before you take a shower switch on the boiler. Very well arranged and both the owner as the cleaning lady are very friendly and helpful. Thanks a lot for this nice vacation." Thank you for your review and I am so pleased you had a lovely time at Diana. The water is heated via solar heating and in the summer the water is always scalding. If it isn't quite sufficient in the winter months the immersion can be switched on to top up as you mention. It should heat up to piping hot within 10 minutes or so. I am delighted you enjoyed your time in Cyprus - we would love to welcome you back again! A very attractive small (40 apartments) complex in a residential area with a reasonable shop nearby. A car is not essential but will greatly enhance the holiday if booked even for 2 or 3 days. Safe private parking is provided. The complex has a lovely pool, warm, gently sloping with plenty of shallow end, which is brilliant for children. The gardens are very attractive and well maintained. The apartment is spacious with comfortable beds and benefits by being at the end of a block allowing a mix of side front and back windows to create an excellent through draft. Lighting is excellent and kitchen facilities are good. The large balcony with comfortable recliners overlooks the pretty pool and gardens. Spacious apartment with fabulous pool. We had a super 10 day holiday with our teenage daughters. The apartment had everything we needed and the pool was fabulous. It was a real bonus having allocated sun beds so no stressing about not getting a place to lie by the pool! Most days the pool area was quiet and we even had it to ourselves on a few occasions! The nearest beach is about a 15/20 minute walk which isn't too far but in the heat it is a bit of a struggle. We decided to hire a car for a week and Heather was fantastic with her recommendations and swift communication. The car gave us much more freedom and we found some lovely beaches which were around a 20/30 minute drive away. Corallia Beach was our favourite. Coral Bay is also nice, very busy but lots of watersports available if you fancy jet ski-ing, parasailing etc. The girls best day out was at the Aphrodite Water Park, a definite must! Book online the day before to save 20%. Another great day out was at Latchi Beach, around a 45 minute drive away. We hired a boat for four hours, approximately 125 euros from Latchi Watersports. Excellent fun and we stopped off at various points and snorkelled, all masks provided on the boat. So many restaurants to choose from in Paphos itself. The closest one is a 5 minute walk, Pambis Diner, which we went to three times. Lovely food and perfect if you can't be bothered to walk to the main drag which is at least 20 minutes away. Our girls loved 'Fat Mama's'. Very busy and a bit cheesy with a cabaret act but the food was very good. Heather has been fantastic to deal with, every email has been promptly replied to and so many helpful tips. Would highly recommend! Thank you so much for your kind review and I am delighted you enjoyed your stay! Should you decide to travel to Cyprus (or Bulgaria) again we would love to accommodate you and if you book direct you would also qualify for a guest loyalty discount! Lovely, clean, spacious apartment on a very nice complex. Lovely pool and gardens well maintained. We had two young children with us who loved the pool! It’s a fair walk to the town/beach with small children so would recommend taking a buggy for little ones. Thank you so much for your kind review and I am delighted you had a good holiday and enjoyed Diana and Cyprus. The walk to the seafront and beach should only take around 15 minutes, so I do hope you found the fastest way and the directions in the information folder. I take your point though that with little ones a buggy is probably advisable! If you decide to visit Cyprus or Bulgaria again in the future we would love to welcome you back and there is a 5% loyalty discount if booking direct. A great apartment to both relax and explore! We absolutely loved our stay here! 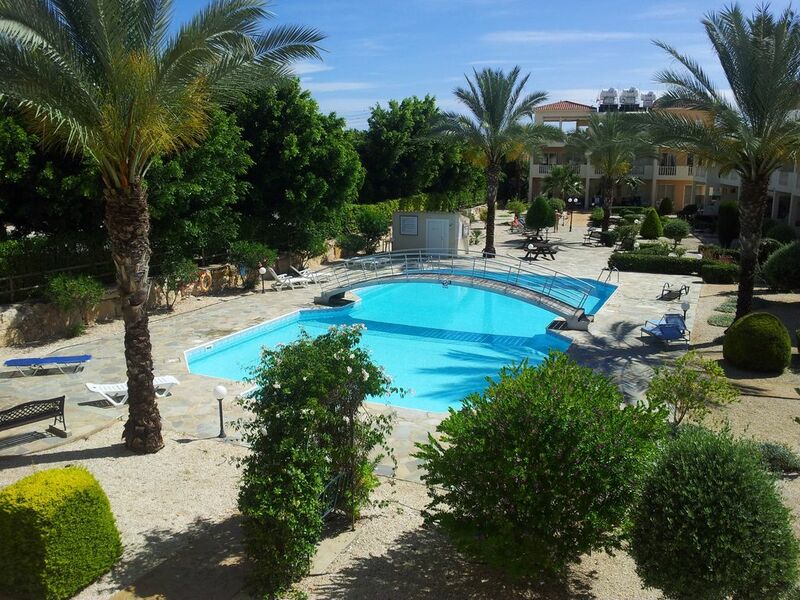 The apartment was only a short walk to the hustle and bustle of Paphos centre whilst being easy to get out to explore the gorgeous hillside villages and restaurants. The large pool was great for some refreshing morning swims and games during the day. With a large balcony overlooking the pool it provided a lovely environment for some quite competitive card games in the evening. When we arrived, the apartment was clean and well presented and the owners were helpful and friendly. They had some excellent recommendations on places to eat too. Had a fantastic week. The apartment is beautiful and is equipped with everything needed, including beach towels and is located in a quiet area of paphos. The pool is lovely with nice comfortable sun beds to hand. The harbour is a 20 minutes stroll away where the are lots of shops and restaurants. Thank you so much for taking the time and trouble to review the property and I am delighted you enjoyed your holiday and had a comfortable stay. I would love to welcome you again in the future to one of our properties in Cyprus or Bulgaria and would be glad to offer you a 5% loyalty discount if booking direct. Diana is gelegen in Paphos, op slechts 15 minuten rijden van de luchthaven of een en een half uur rijden van het vliegveld van Larnaca Paphos. Vervoer naar de luchthaven kan worden geregeld en we bieden flexibele overgang dagen evenals aankomst- en vertrektijden - je bent meestal welkom om te blijven tot aan uw vertrek tijd (dat kan zo weinig als 15 minuten voor vertrek!). Autohuur is direct beschikbaar en kan zowel voorafgaand aan de reis worden geregeld van en naar de luchthaven verzameld of geplaatst in Paphos zich tijdens uw verblijf. Een groot scala aan activiteiten worden aangeboden in de Paphos gebied en je kunt alles van visreizen naar jeep safari, quad rijden, uitstapjes naar de prachtige Paphos Water Park, Troodos-gebergte, archeologische sites, musea, Diepzeeduiken, Ostrich Farm, 2 regelen -dag Cruises naar Egypte etc etc !!! ... Of u kunt gewoon relaxen en ontspannen bij het zwembad !! !